1. Improve the shelf life of their food products within the cool room environment. 2. Keep their cool room environment mould, odour and bacteria free for longer between regular hygiene and cleaning services. Jayfresh is a chlorine dioxide based slow release mould and bacteria abatement system. It provides outstanding advantages over other biocides, oxidants, sulphide scavengers and other traditional methods. Chlorine dioxide has a long and established history of providing proven and safe benefits in the fight against mould and bacteria. It has been safely used for more than 70 years to disinfect much of the nation’s food and water supply and is also used at more than 900 water treatment facilities around the world everyday. The patented self-activating chlorine dioxide powder technology is a potent biocide that attacks odour, moulds and bacteria at its source. The Jayfresh sachet is effective in confined spaces and starts to work with exposure to ambient water vapour and lasts for up to 30 days. Conventional deodorisers absorb or cover up odours with fragrances but the Jayfresh slow release sachet oxidises compounds such as animal and human waste, bacteria, mould and odours that are produced by mildew and off-gassing of food. Jayfresh allows food service businesses the opportunity to manage coolroom hygiene without the need to change batteries or replace expensive UV lights. In addition to this it does not require electricity and so there is no need to connect to a power source to effect this technology. Jayfresh creates an environment that inhibits the ability for mould or bacteria to flourish by slowing releasing safe levels of chlorine dioxide into the environment. It also prevents and inhibits odour from off-gassing food. Extended and better hygiene levels of cool room environments between regular hygiene clean servicing meaning more hygienic food environments and lower costs of servicing. Jayfresh addresses all the major shortcomings of other products currently on the market. Recent trials in hotel restaurant coolrooms have proven extremely successful especially with berries and herbs maintaining their freshness for longer and achieving an extended shelf life. 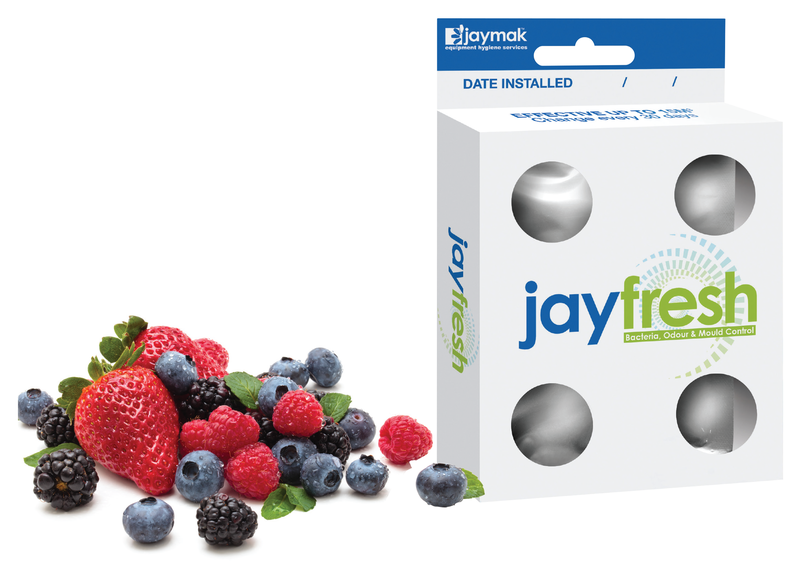 Jaymak Australia is the only provider of Jayfresh. It is available through their franchisee network or directly from the website. Now conveniently available in boxes of six and will last a food services business for 6 months. How often should you change a Jayfresh sachet? A Jayfresh sachet will be most effective within a standard cool room environment for a one-month period. After this is mould, odour and bacteria abatement properties will decrease in effectiveness and the Jayfresh sachet should be changed. One of the positives about Jayfresh is how simple, risk free and easy it is to use this technology. It is as simple as activating the sachet and placing it in the most effective place within the coolroom to inhibit odour and mould and bacteria growth.